The FLIR Systems PathFindIR is a compact thermal imaging camera that significantly reduces the hazards of night time driving. Automotive Night Vision Systems enable drivers to detect and monitor potential hazards on or near the road, allowing more time to react to any potential danger. PathFindIR Thermal imager helps the user recognise pedestrians, animals, or objects in total darkness, smoke, rain and snow. The PathFindIR is available in 25 Hz PAL / 30 Hz NTSC or 8.3 Hz PAL / 7.5 Hz NTSC. 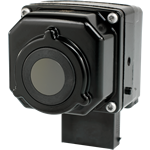 The PathFindIR incorporates an uncooled 320 x 240 pixels microbolometer. This maintenance free system delivers crisp video images which can be displayed on virtually any display that accepts composite video. The PathFindIR is equipped with an 19 mm wide angle lens. It give you an extremely wide field of view (36°), resulting in excellent situational awareness. The PathFindIR is extremely rugged. Its vital core is well protected against humidity and water. The PathFindIR can be cleaned with a hose just like any other equipment. The PathFindIR operates between -40°C and +80°C. The PathFindIR is extremely compact (5.8 x 5.7 x 7.2 cm) and weighs only 360 grams. This allows for easy integration in any vehicle. The PathFindIR can easily be installed behind a vehicle grill or in any other compact location. A 6 meter long cable is available for routing the PathFindIR’s power and video interface into a passenger compartment. On one side the cable connects to the PathFindIR. On the other end it has 2 wires that can be terminated, as required by the user, for hooking into the vehicle power bus and a video cable that is terminated with a BNC connector. It can be adapted to the video input connections on most standard monitors.